IBS is a gastrointestinal disorder, characterized by altered bowel habits and abdominal pain in the absence of detectable structural abnormalities. Altered bowel habits are in the form of constipation, diarrhea or both. Associated symptoms may be abdominal pain and or flatulence. Clinical association of emotional disorders and stress with symptom exacerbation. The therapeutic response to therapies that act on cerebral cortex. No clear diagnostic markers exist for IBS. Hence the diagnosis is based on clinical findings. Stool reports are normal, i.e. without micro-organisms, pus cells, mucus, and blood. Colonoscopy is normal i.e. without signs of inflammation or ulcers. CNS dysregulation leads to impaired motor reactivity of small bowel and colon to a variety of stimuli. It also leads to altered visceral sensation. (Both lead to motility disorders like constipation and or diarrhea and abdominal pain). This system makes the gut self sufficient, i.e. its’ work does not get disturbed seriously if the extrinsic nerves are not functioning. These intrinsic nerves release large variety of neurotransmitters. Afferent nerves carry mechanical or chemical stimuli from gut. They are afferent fibers of 10th cranial nerve – Vagus. Few travel in dorsal root of spinal cord. Efferent nerves reaching gut are parasympathetic and sympathetic fibers. Parasympathetic fibers travel in vagus nerve and in sacral outflow. Sympathetic fibers travel in thoracic outflow. Parasympathetic stimulation leads to increased motility and secretion. Sympathetic activity inhibits motor activity & lead to contraction of sphincters. 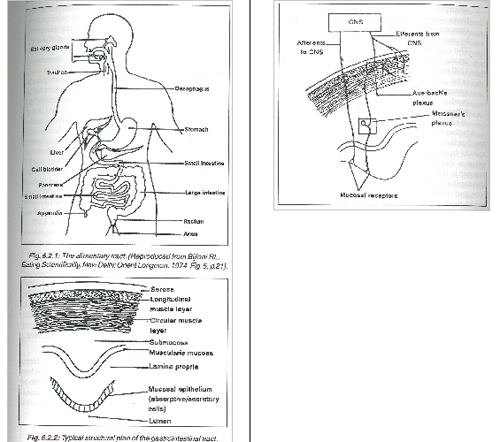 It aslo needs to reduced blood flow in gut circulation which, may lead to reduced secretions. This shows that parasympathetic stimulation will lead to diarrhea and sympathetic stimulation may lead to constipation. Higher neural influence – Limbic system is the seat of emotions. The emotions like fear, anxiety, frustration, insecurity lead to activation of vigilance network, which increases alertness. Stimulation of limbic system (Hypothalamus), limbic cortex and pre-frontal cortex due to emotions and thought process affect the function of gut, via efferent fibers of parasympathetic and sympathetic systems. Thus psychogenic factor plays a major role in exacerbations & remissions of IBS. It is said that, the sorrow which does not have a vent in tears, makes other organs weep. Hence therapy is directed to both mind & gut. Medical Yogatherapy offers, predictable help in IBS. Following is the Therapeutic schedule advised. 2 days Therapeutic Postures with Props. 2 days Pranayam Sequence with Shavasan and Meditation. 2 days Basic Yogic Posture Sequence. Practice of Ashtang Yoga helps in perception correction, cognitive changes, emotional stability & psychological strength. Patients suffering from IBS improve in their symptoms after Yogic study, continued for 6 – 8 weeks.